John F. Kennedy was President of the United States for only two years and ten months, and yet, 47 years after his assassination in Dallas, his legend endures. In 1946, after returning from WWII, a 28-year-old John Kennedy entered politics when he filled U.S. Representative James Curley's vacated seat (Curley left to run for mayor of Boston). 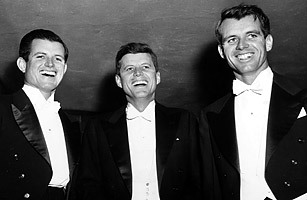 Kennedy switched to the Senate in 1952 and remained there until 1960 when he was elected President  making him, at age 43, the youngest elected U.S. President. Upon taking the oath of office, he remarked that "the torch has been passed to a new generation of Americans," and he was right. Kennedy was also the first U.S. President born in the 20th century. With an approval rating that reached an astonishing 83% in 1961, Kennedy was beloved across the country. In some ways, the nation still mourns his death today. But John was not the only one of Joe Kennedy's sons who was adept at politics. His brothers, Robert and Ted, were equally precocious. Robert Kennedy served as U.S. Attorney General  providing the Civil Rights Movement with much needed government support  from 1962 until 1964, when he resigned to run for U.S. Senate. (He won.) It's difficult to say whether Bobby Kennedy would have won the 1968 U.S. Presidential election had he not been assassinated, but his success in the Democratic primaries indicates that he would have given his opponents a good fight. Upon news of his death, the United Nations lowered its flag to half-staff  an unprecedented tribute to a man who, technically, was only running for President. Ted Kennedy entered politics at age 30, when he filled the Senate seat once held by his brother John. He was working on the Senate floor when he learned of John's death in 1963, and he endured a "Draft Ted" campaign after Robert's in 1968 (which he declined). Instead, he served Congress for 47 years before dying of a brain tumor in 2009.